The change of season brings with it a new injection of seasonal dishes on Greenhouse Restaurant’s discerning Spring Provenance menu and of course, all meals are served with Chef, Peter Tempelhoff’s signature precision and culinary creativity. The Spring Provenance menu draws on seasonal components from the sea and the garden, fields and orchards. 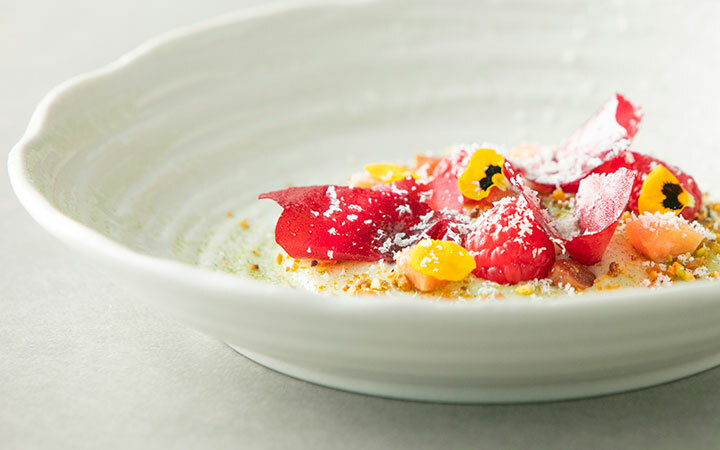 All courses remain true to the ethos of ingredients with meaning, which has won the restaurant the prestigious accolade of Eat Out’s Top Ten eateries to visit in South Africa for eight years running. Greenhouse Restaurant’s Spring Provenance menu has been in the planning for months. Commenting on the new courses, Tempelhoff says, “You can expect Greenhouse’s five-star sensory dining standards we’ve maintained through our contemporary Cape menu in a sleek and simplistic setting amongst the lush Cellars-Hohenort grounds. Our garden and valley has sprung to life and we are bringing all the green we can into the kitchen and onto the menu”. The menu does not deviate from the Greenhouse’s notable traditional tasting structure and is curated as a series of seven taster courses – canapes to start, followed by three starter dishes, a main that is punctuated by a cheese and then a dessert course. “ Our menus are narrated as a holistic epicurean experience”, comments Tempelhoff. “We have two dedicated foraging specialists searching for spring mushrooms and our chefs go on two outings a day to source wild, local ingredients”. These culinary excursions underpin Tempelhoffs dedication to traceability and pay homage to his intimate knowledge of localised elements which are vital to all his dishes. The menu has reserved the last of the Karoo truffles and is serving them alongside a lacquered duck breast with endive and a nasturtium & hazelnut crumble. To add to the tantalising narrative is Dairy Cow with wild grass & milk skin. Tempelhoff has sneaked in a surprise luxury ingredient in some of the dishes on offer. Of course, vegetarians are catered for too with a 10-course menu boasting all the seasonal and local ingredients the traditional menu offers. The carefully crafted and playful menu is R1200 a head and promises a truly unforgettable dining experience. All dishes are paired with exquisite South African wines for the ultimate sensory dining-out experience.